Cones have a white inner layer and red overbase for extra target value. 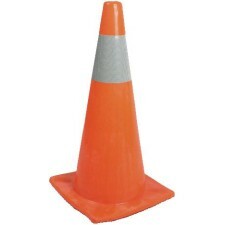 Ideal for traffic control and various other applications. High visibility provided by fluorescent pigmentation with ultraviolet additives to protect against color fade. Available in plain or with reflective collars. Two sizes available - 18" and 28"